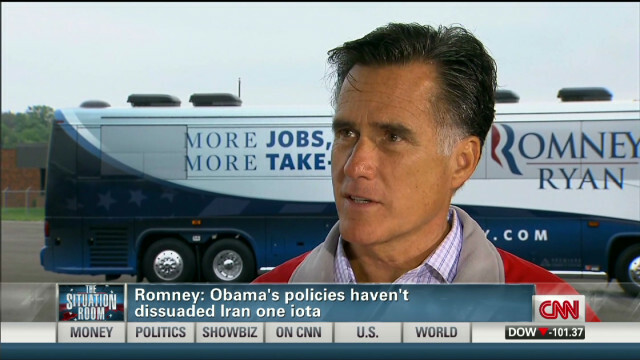 Romney to CNN: I’m overwhelmingly committed to helping every American. ACOSTA: And it seems that your main message in this campaign has been about the economy. But that message is not resonating, at least not here in Ohio. And I wonder how much of that is self-inflicted. What would you say to Americans out there who wonder if the — if that videotape that came out last week is the real Mitt Romney? ROMNEY: I’m overwhelmingly committed to helping every American. That’s what this campaign is about. From the very beginning of my campaign, I’ve spoken about the need to help get people out of poverty, the need to get the 23 million people that don’t have good jobs, struggling to find work, to help those people get good jobs. My whole campaign is about getting the economy going. People at the top are doing fine. They’ll probably do fine whether Barack Obama were reelected or not. It’s the people in the middle and at the bottom that are struggling in the Obama economy. That’s why I’m running, is to help them. ACOSTA: And you criticized the president for referring to recent events in the Middle East as bumps in the road and you talked about the death of Ambassador Stevens and basically said that these aren’t bumps in the road, these are human lives. Do you think the president intended to refer to Ambassador Stevens’ death as a bump in the road? ROMNEY: Well, he was asked about the developments in the Middle East. And he said the developments in the Middle East are bumps in the road. And those developments include 20,000 people being killed in Syria, a Muslim Brotherhood president of Egypt, Iran on the cusp of becoming a nuclear power, and, of course, the assassination of our ambassador in Libya. I’m not sure whether any of those qualifies as a bump in the road. They certainly don’t in my view. ROMNEY: Well, that’s — I — he was asked about the developments in the Middle East. I’m not sure which developments in the Middle East he would consider bumps in the road. I consider the developments in the Middle East a very troubling development — a very troubling course. I believe, also, that the — the White House’s failure to acknowledge that — that the assassination of our ambassador was a terrorist attack, a terrorist event, suggests that they are trying to paper over the seriousness of the — of — of what’s happening in the Middle East. ACOSTA: And just the other day, you said the president has been trying to fool people with his ads and his speeches about your record. But fact checkers have also taken issue with your ads. Haven’t you also played fast and loose with the facts from time to time? ROMNEY: We’ve been absolutely spot on. And any time there’s anything that’s been amiss, we correct it or remove it. ACOSTA: Even the welfare ad? ROMNEY: The pre — the — absolutely. Look, it — it has been shown time and again that the president’s effort to take work requirement out of welfare is a calculated move, the same thing he did with regards to food stamps. He took wor — work out of welfare in the — excuse me, work out of the food stamps requirement. The study shows that twice as many people went from — from having food stamps to — those that are able-bodied — to — from — as a result of that change. ACOSTA: — is that what you’re saying? ROMNEY: — there are — there are — you look at the facts. Did he take the work requirement out of welfare? ACOSTA: — you don’t buy that? ROMNEY: No, no. You always have the capacity to add — to add work. There’s never been a requirement that you can’t have more work. The — the requirement that they’re waiving was saying that people don’t have to work to get — to get welfare. That’s the change that they’ve proposed. I disagree with, with that direction. I think the president is also — I disagree with the direction on — on the work requirement as it related to food stamps. Look, taking workers out of government assistance is, in my opinion, a very — a very bad course to take and creates a culture of dependency. We — we help people who need help. We want to help people that need help. But the idea of removing workers, I think, is a mistake. ACOSTA: What would you do about those referees in the NFL? ACOSTA: Would you order them back to work? ROMNEY: I — I’d sure like to see some — some experienced referees, with NFL experience, come back out of the NFL playing fields. ACOSTA: Paul Ryan called those refs out today. ACOSTA: — are you glad that he did that? ROMNEY: That was just fine. Paul — Paul was very angry that the Green Bay Packers, he believes, won, and the referees took it away from them.